With OnePress or Screenr theme free version, we are highly recommended you use the qTranslate-x plugin to translate the customizer content in different languages. To change the customizer content of home page just go to Appearances => Customizer and using language ISO code, put all the language translation in the same Text editor mode. Then put the code in the text area, As shown in the image below. The en, vi ISO codes stand for English, Vietnamese languages. You can similarly use the ISO codes for other languages as well. Then put the code in the Text editor. 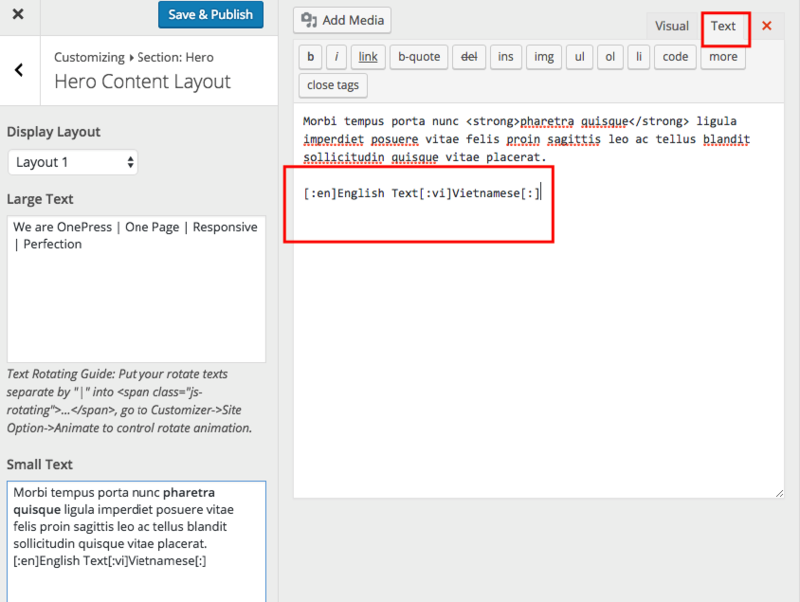 Then this will convert the hero text in the desired language when selected by the user. Furthermore information, you guys can take a look at qTranslate-X.